Never before has music featured so prominently in an election campaign. Tomorrow (March 23) NSW residents, including members of the local music industry and the broader community that supports us, will head to the polls to vote. In recent weeks, industry associations, promoters and artists have done a stellar job bringing music to the forefront of voters’ attention. Live Performance Australia, the Australian Festival Association, Music NSW, APRA AMCOS and the Live Music Office – acting as a coalition – drove a remarkable campaign to educate us on the threat at hand. But it’s not going to be an easy road. Not everyone is with us. Talking to TMN this morning, concert promoter Michael Chugg remains optimistic. But like any industry, we live and work in a bubble. 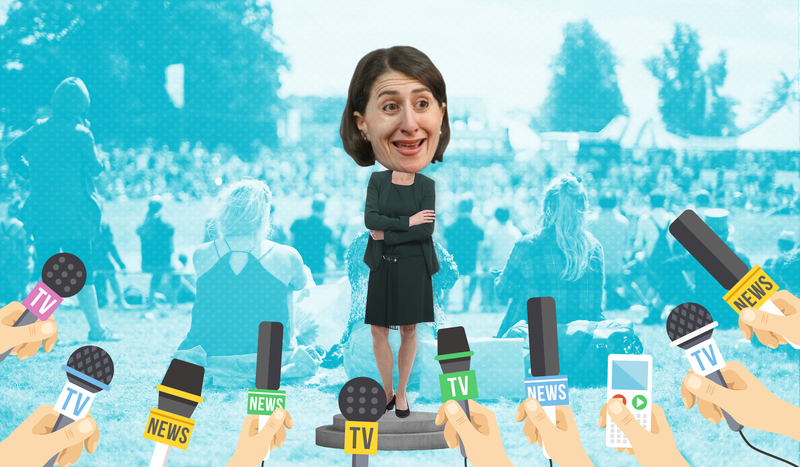 Gladys Berejiklian has a lot to answer for, but she also has the support of a liberal-leaning state. When Pauline Hanson first came to power, she argued that all arts funding should be scrapped and the money given to farmers. Socialist Alliance, One Nation, Shooters & Fishers, Animal Justice, Advance Australia, Liberal Democrats, Voluntary Euthanasia, Christian Democrats and Small Business all earn zero for music-related policies. Sydney’s nightlife, music festivals, arts organisations and, ultimately, music fans from both NSW and across the country who visit the state, have the most to lose. This is your “last drinks” call to arms. When you arrive at your local polling booth on Saturday, #votemusic. TMN looked at the key policy proposals from Labor, Liberal-National Coalition, Greens and Keep Sydney Open. Set up a $100 million Western Sydney Cultural Fund to reflect the region’s indigenous and multicultural mix. Bring the user-pays police to attendee ratio at festivals in line with other states.